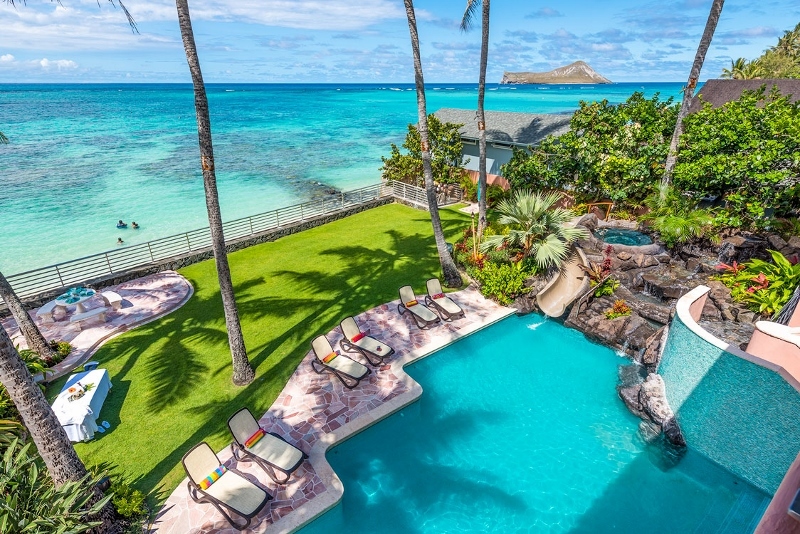 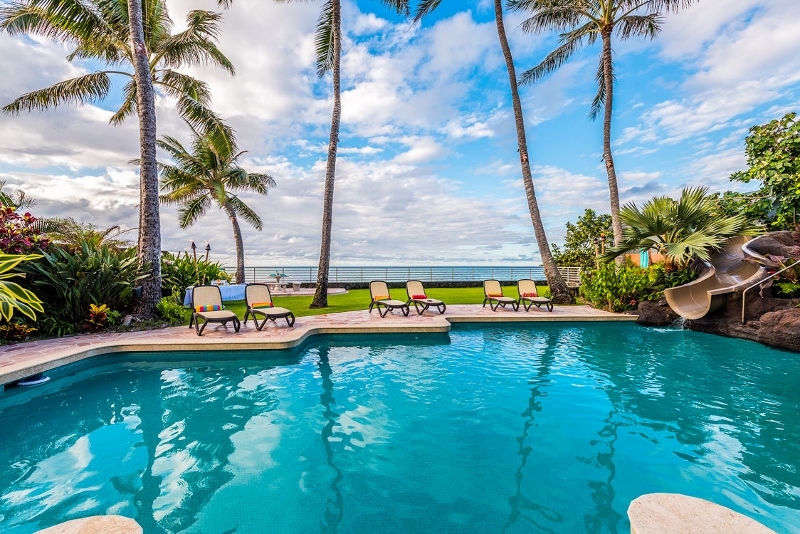 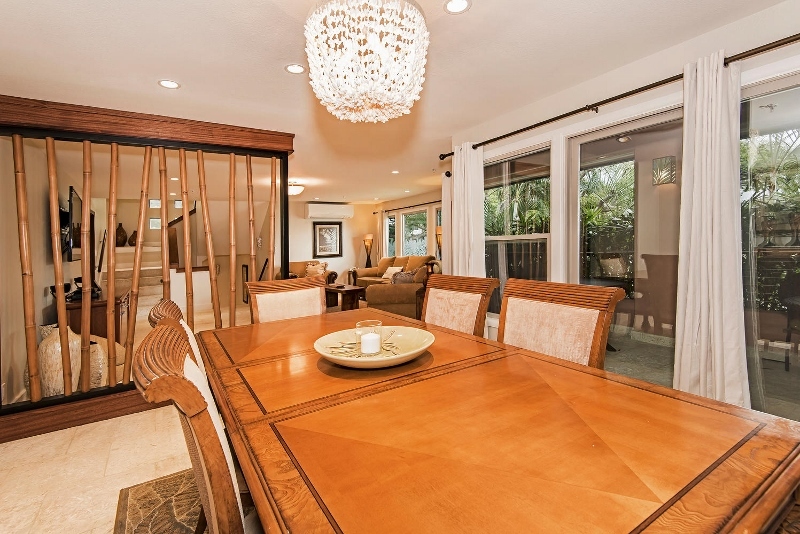 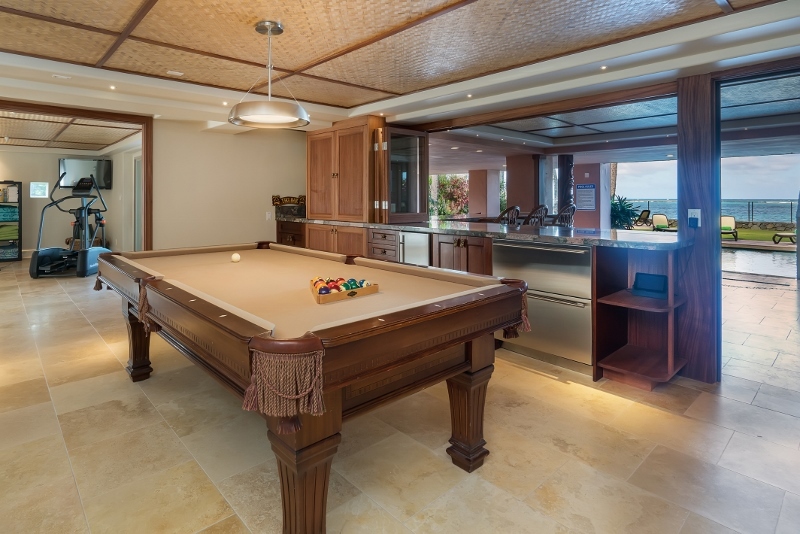 Hawaiian Estate – Luxury Vacation Homes, Inc. 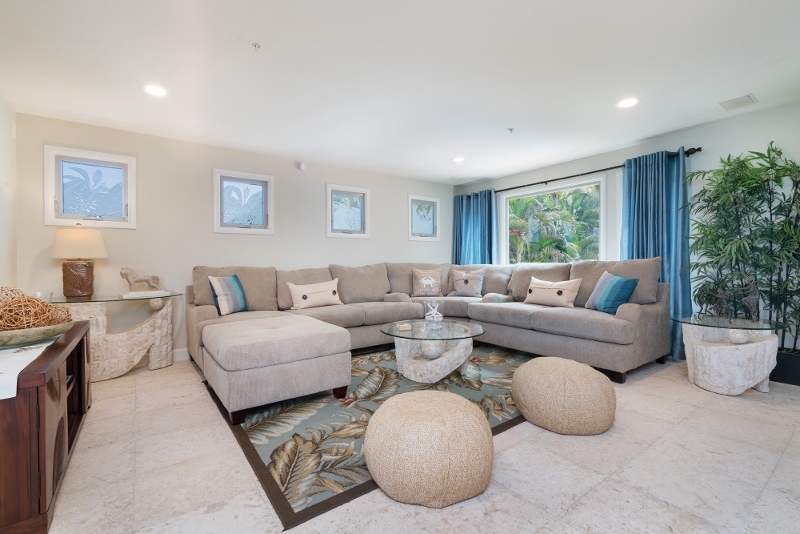 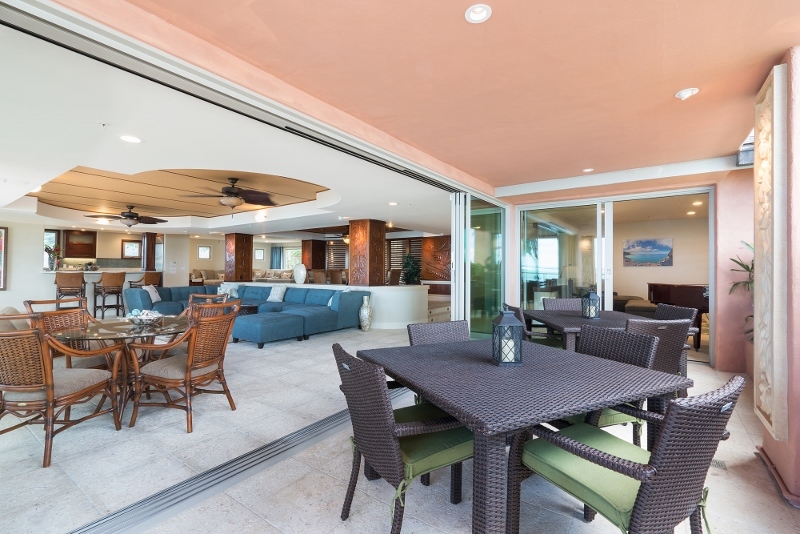 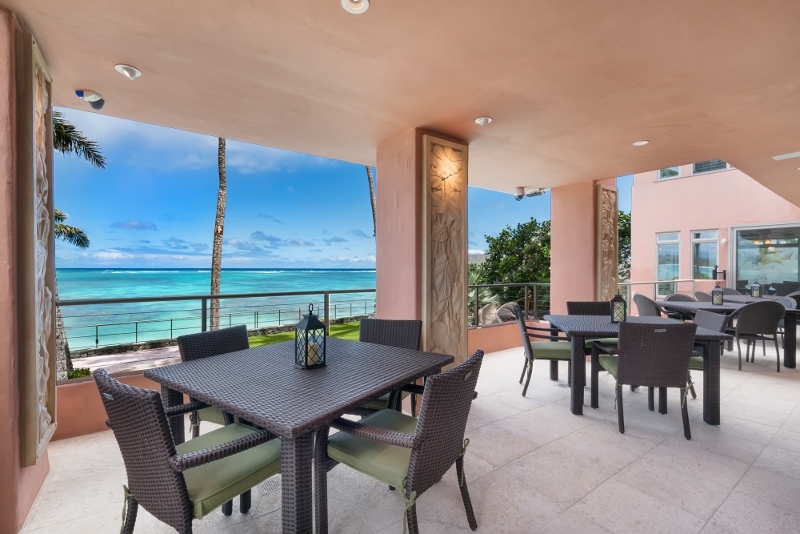 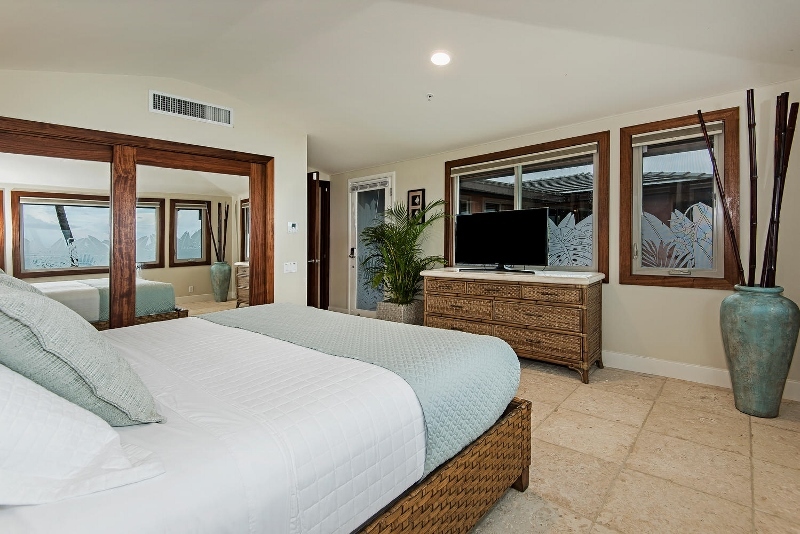 Relax and enjoy luxury beach life like never before as you are surrounded by ocean views on the #1 rated Waimanalo Beach! 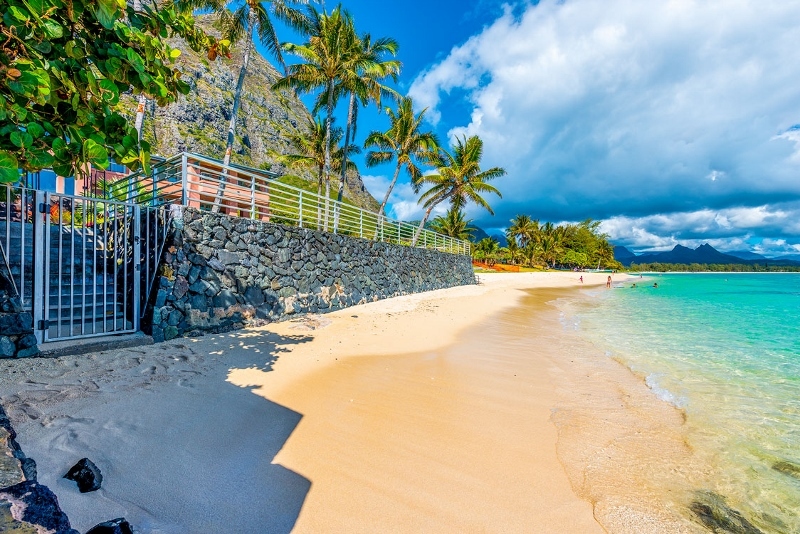 Famous for the filming of Magnum PI, Hawaii 5-0 and Lost, Waimanalo’s small town doesn’t allow hotels, making it the perfect getaway from the busy tourist spots, yet still close to so many great activities and attractions! 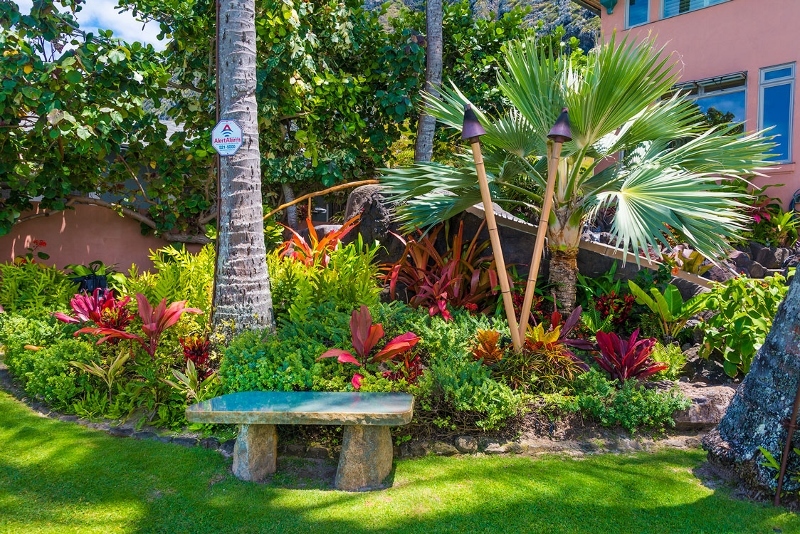 The countryside of Waimanalo is slow moving and filled with Aloha, beauty and authentic Hawaiian experience. 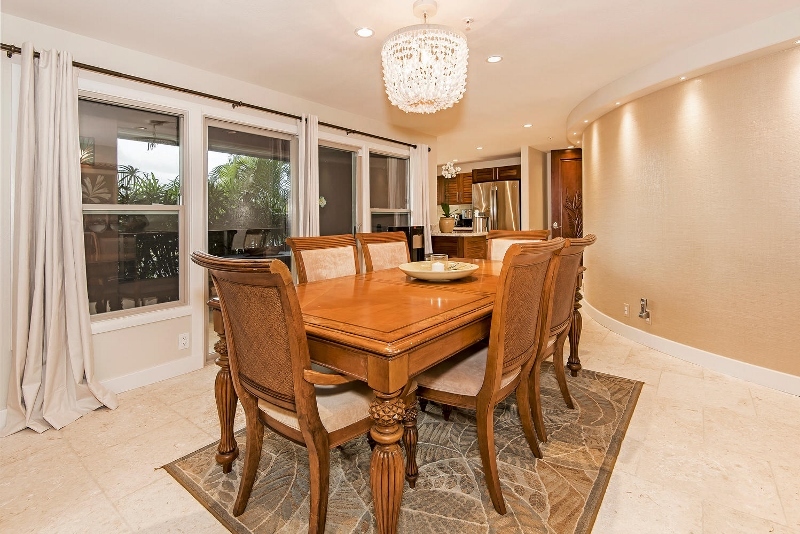 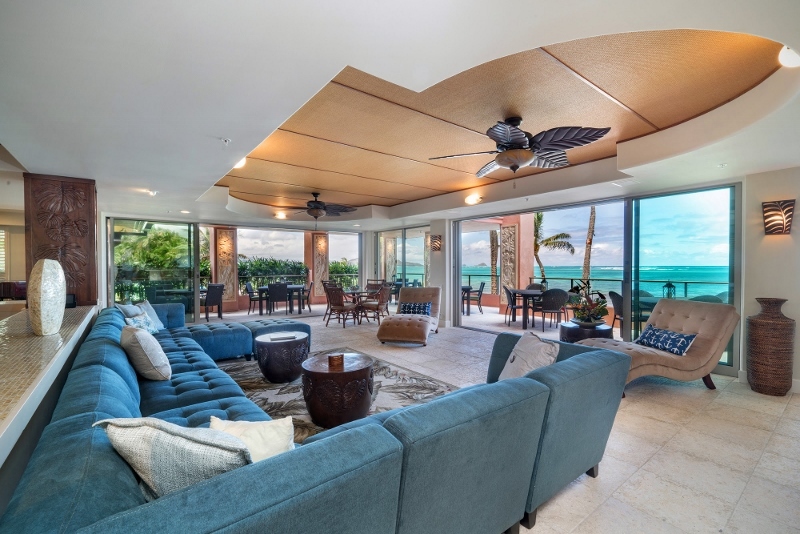 The Hawaiian Estate offers a luxurious and relaxing open floor plan maximizing the breathtaking scenic views from floor to ceiling windows and doors which open up to the beautiful surroundings. 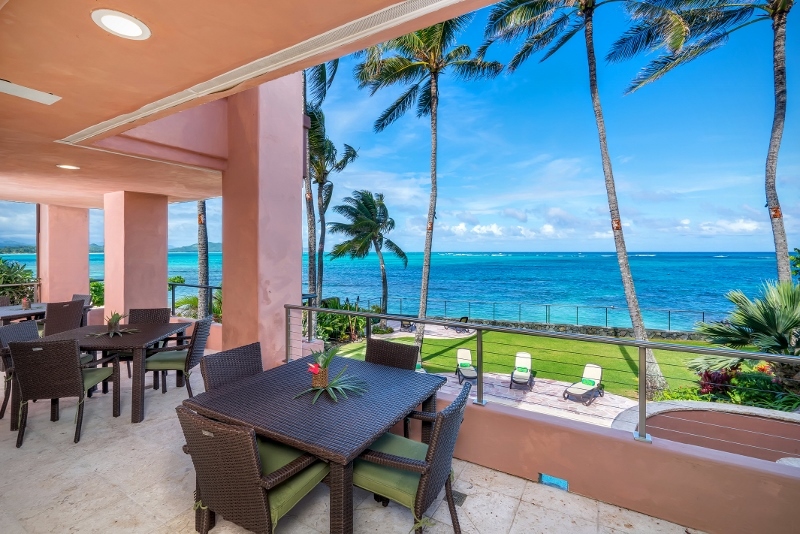 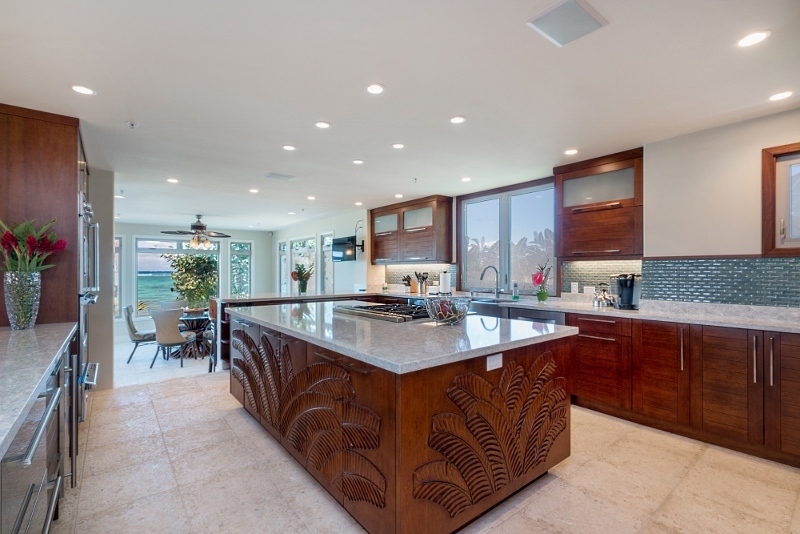 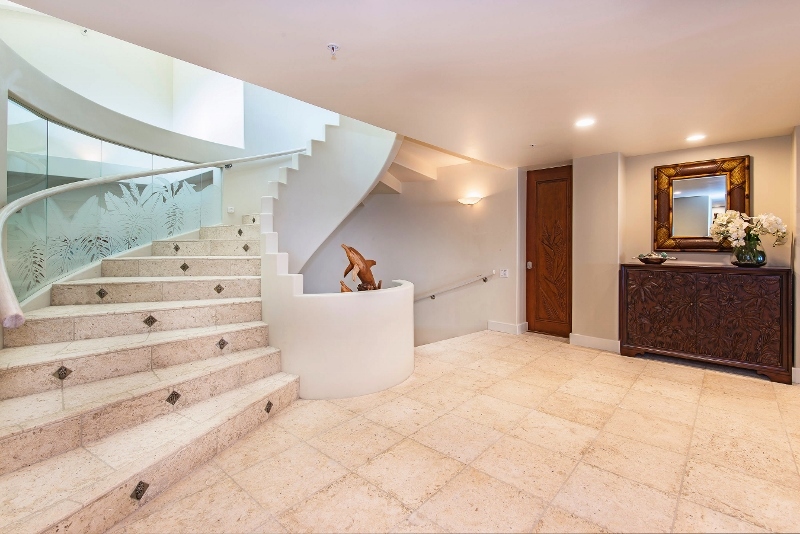 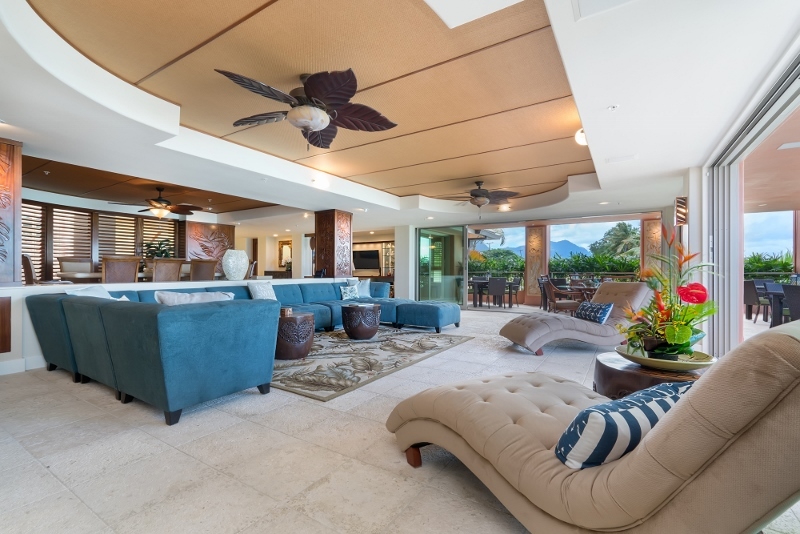 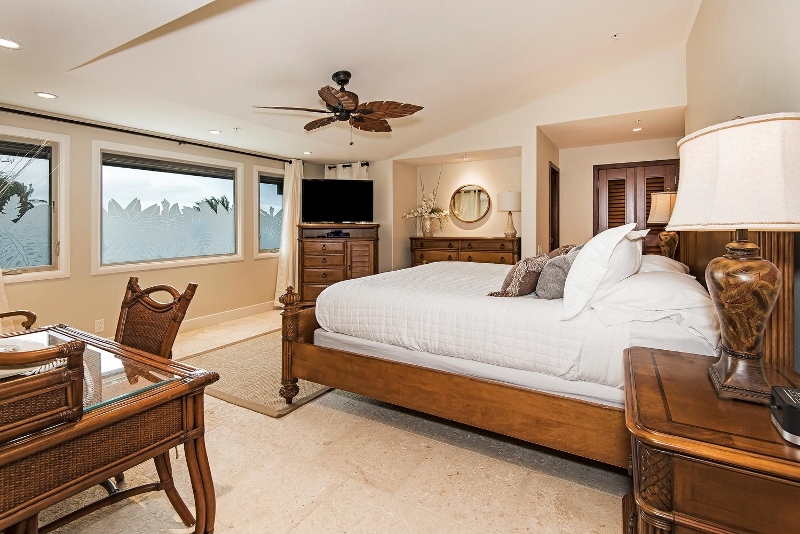 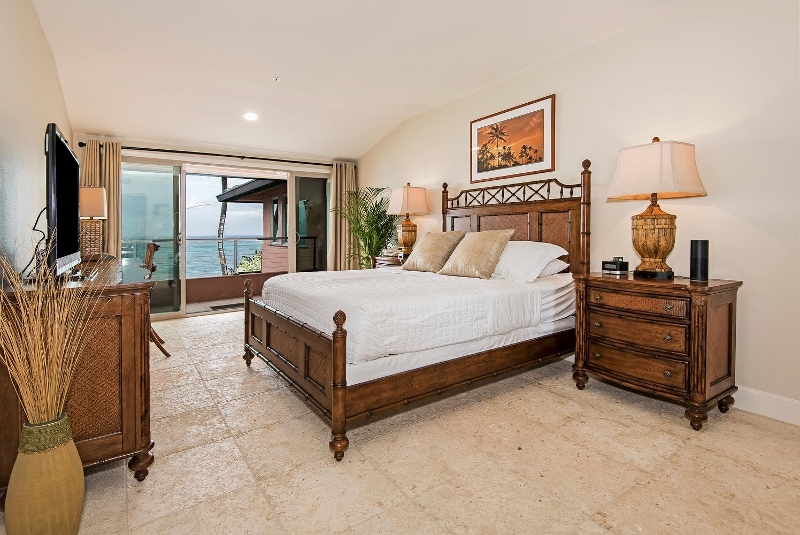 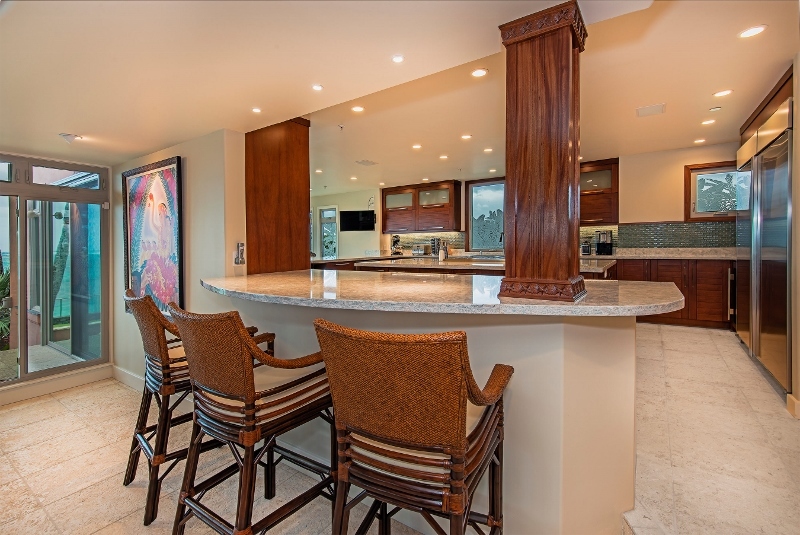 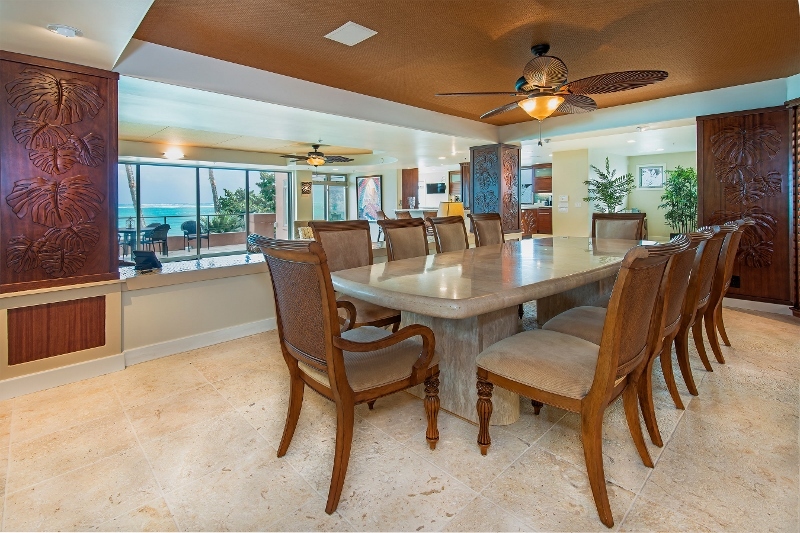 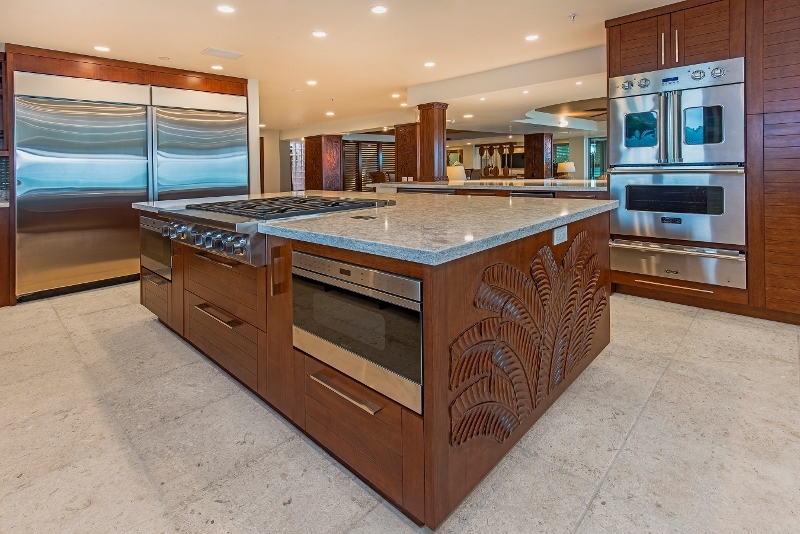 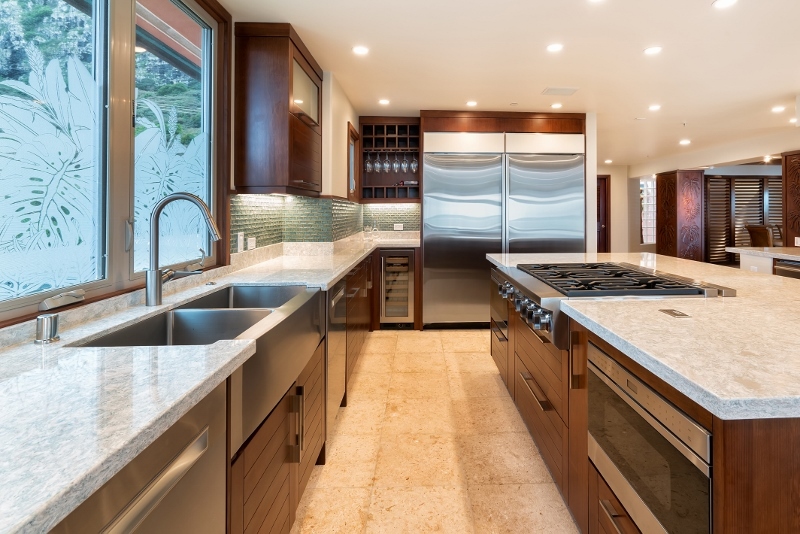 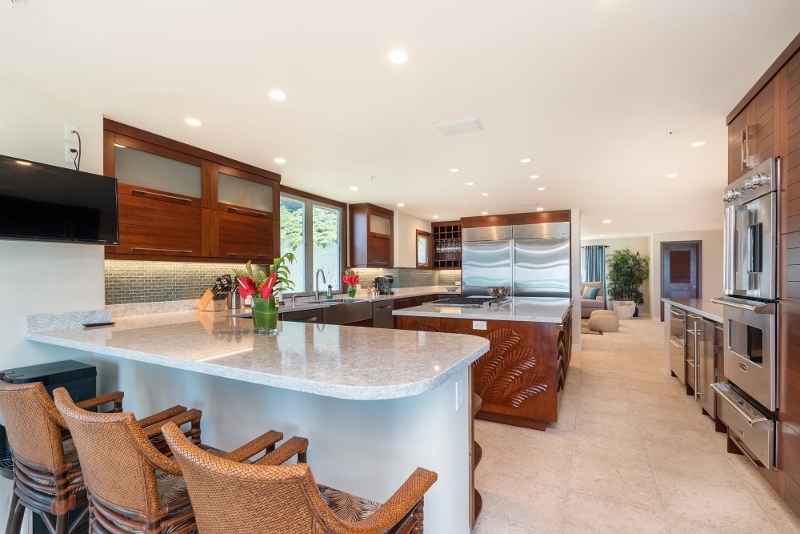 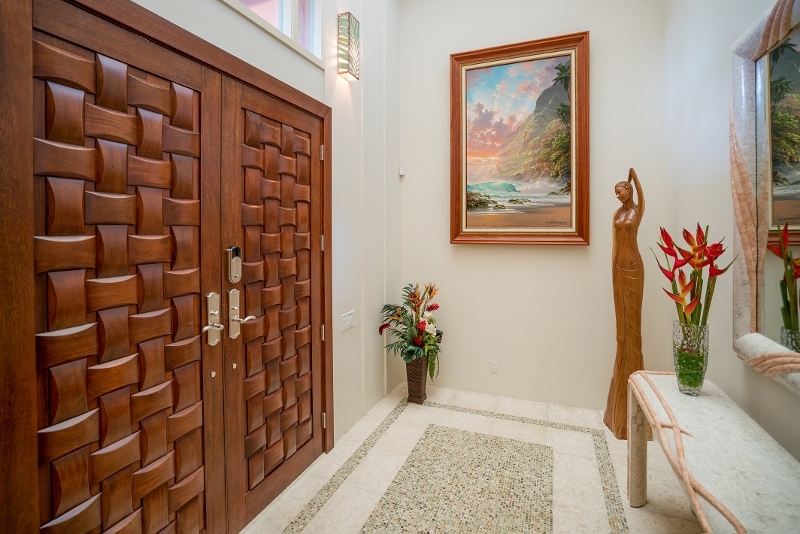 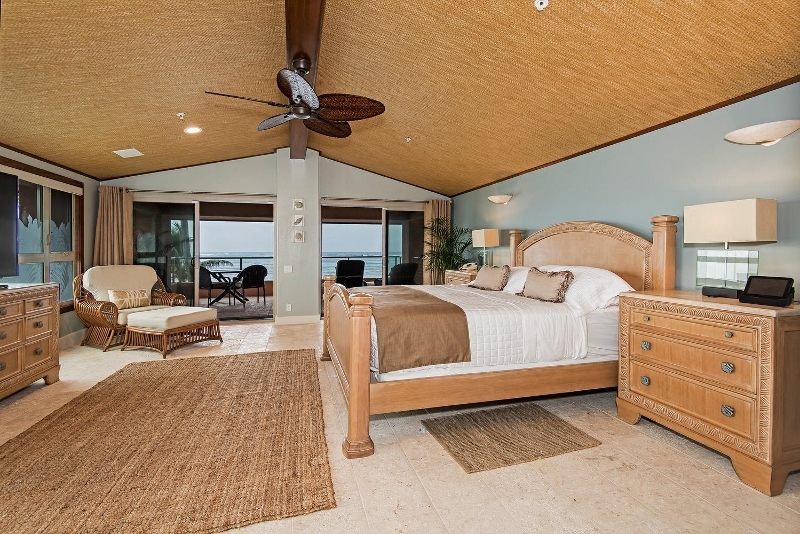 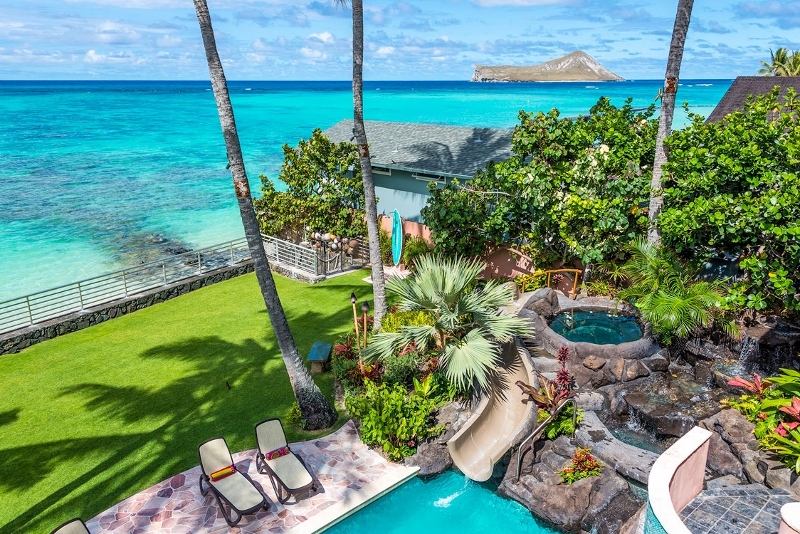 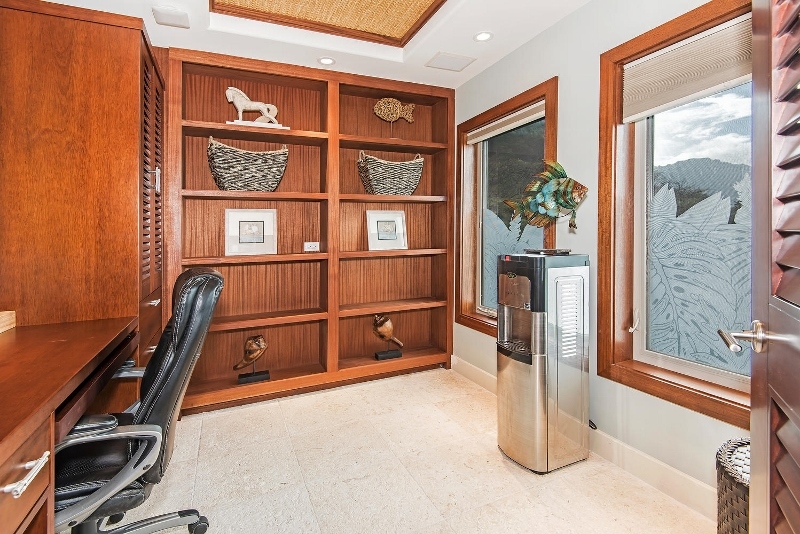 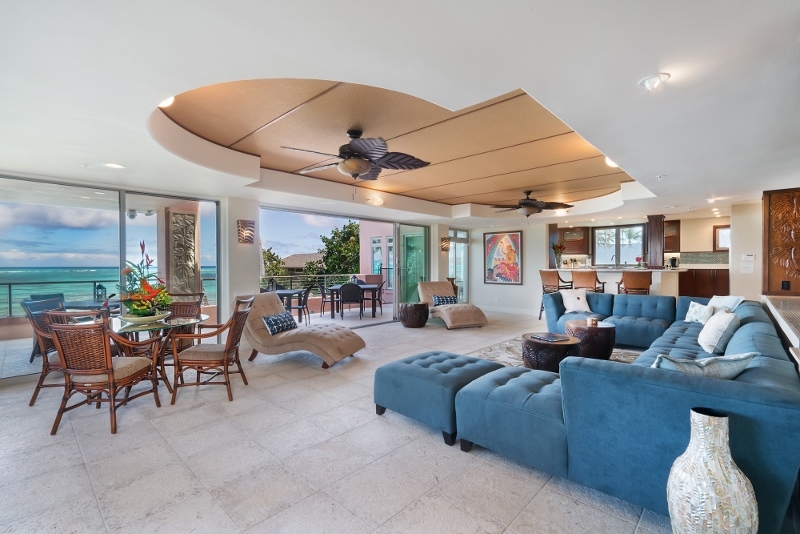 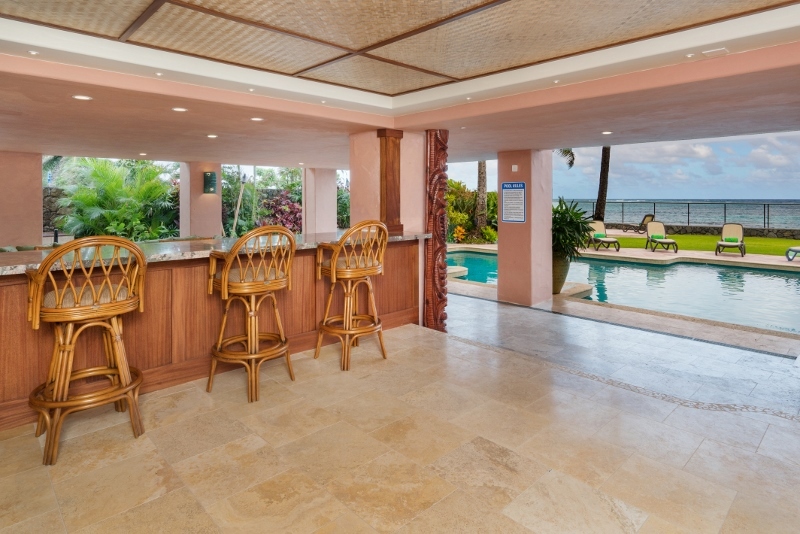 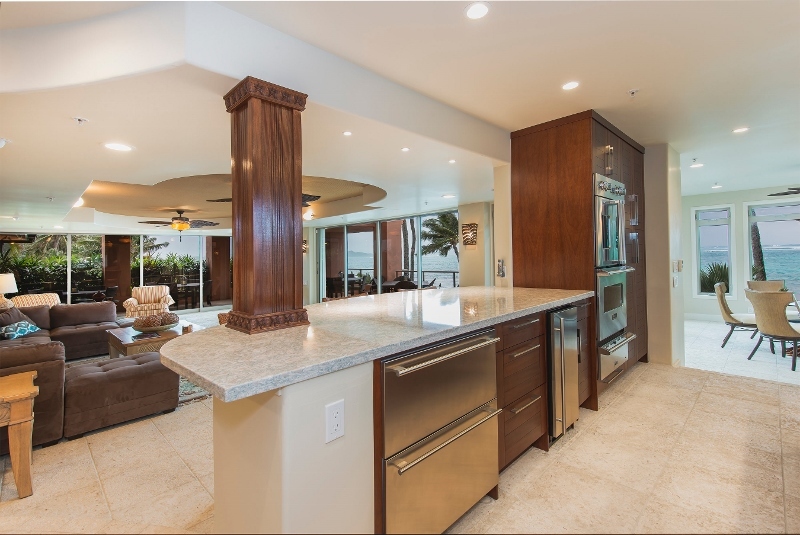 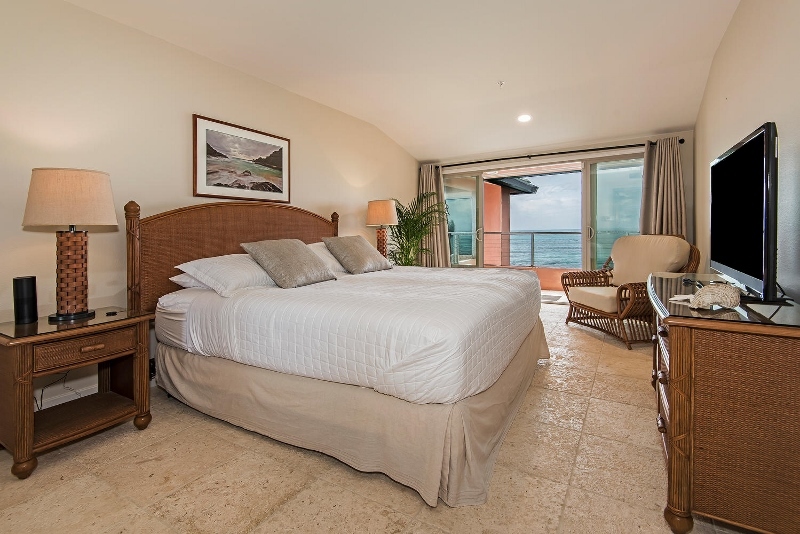 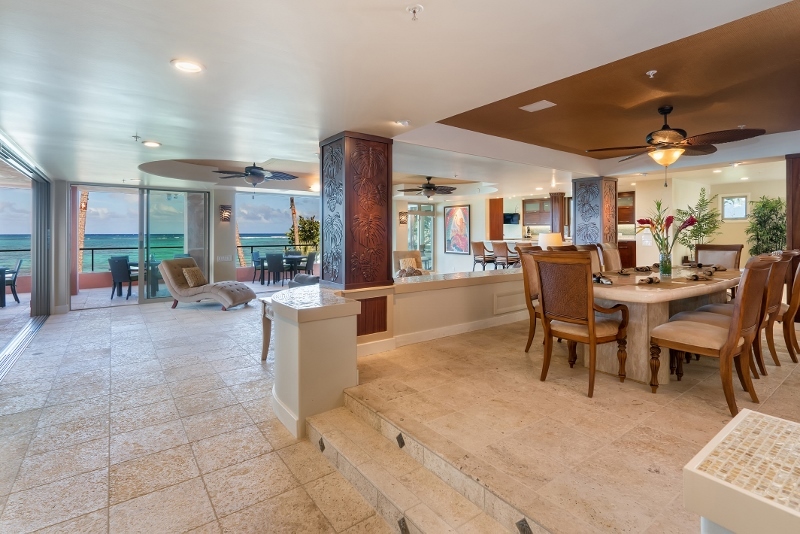 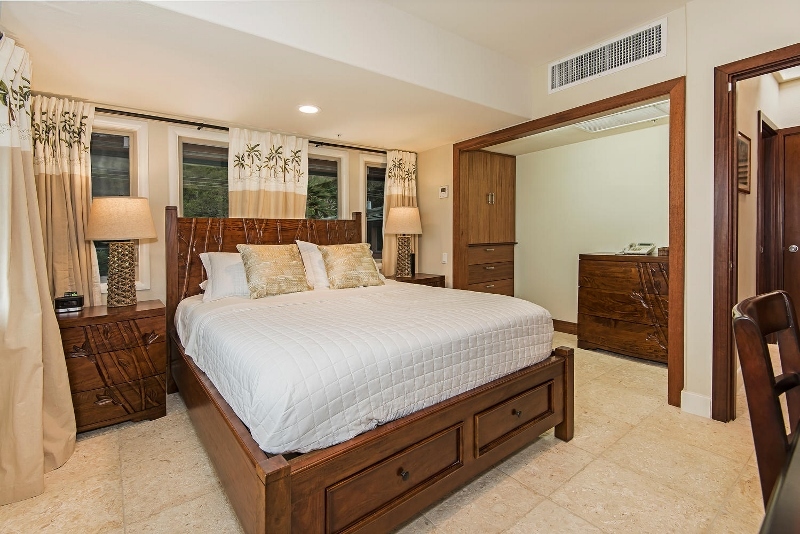 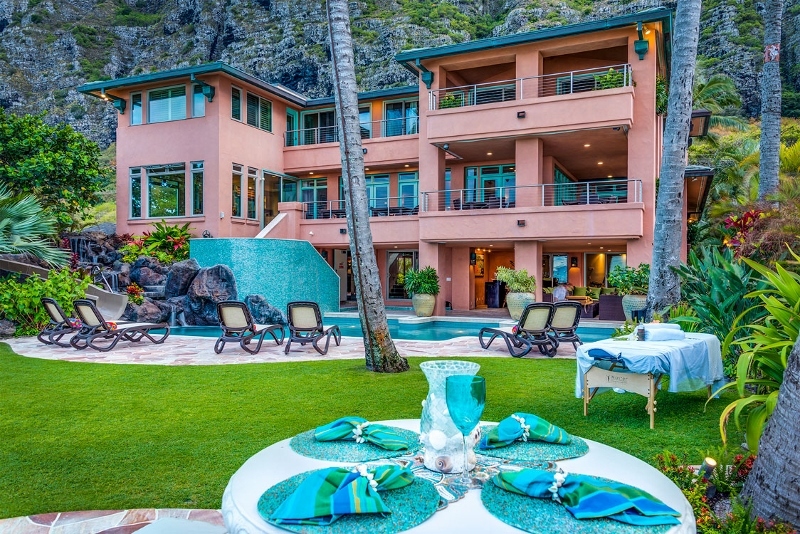 The multiple levels of the estate provides 6 bedrooms boasting beautiful ocean views while the other rooms overlook the spectacular Ko’olau Mountains. 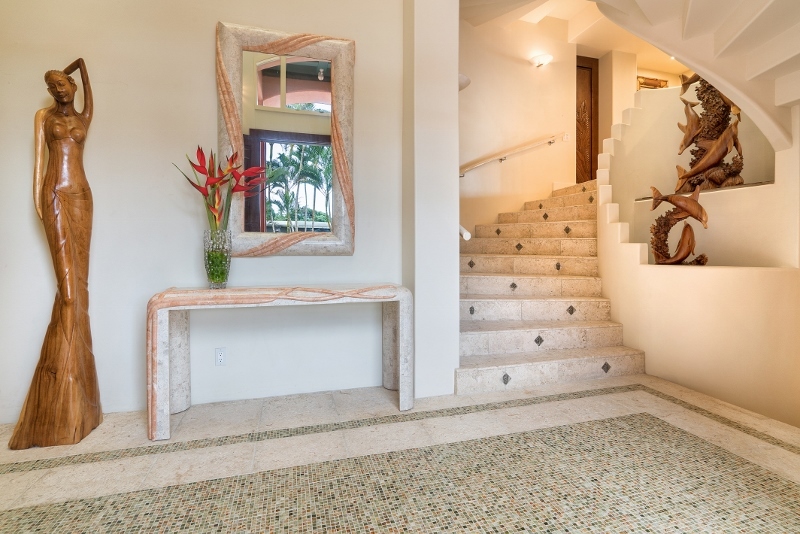 The entryway to the guest wing at the top of the second floor creates options to suit your needs. 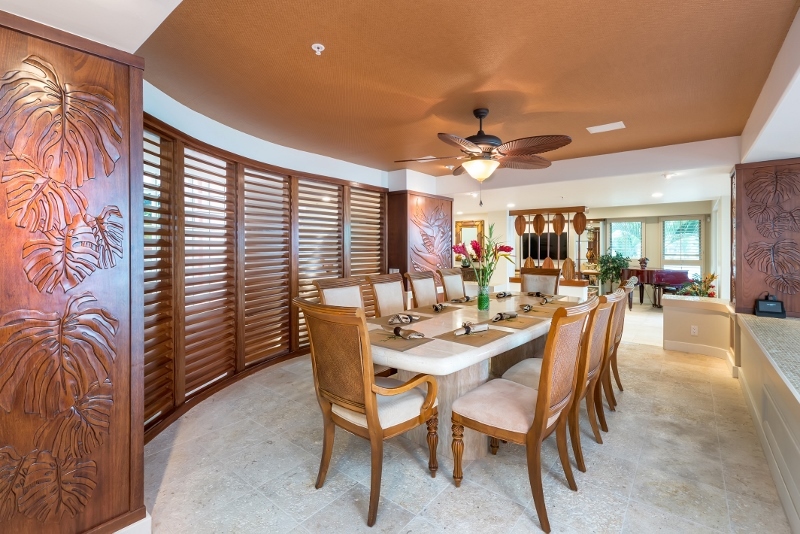 Open up the guest wing for community living or close it for a more private experience among guests. 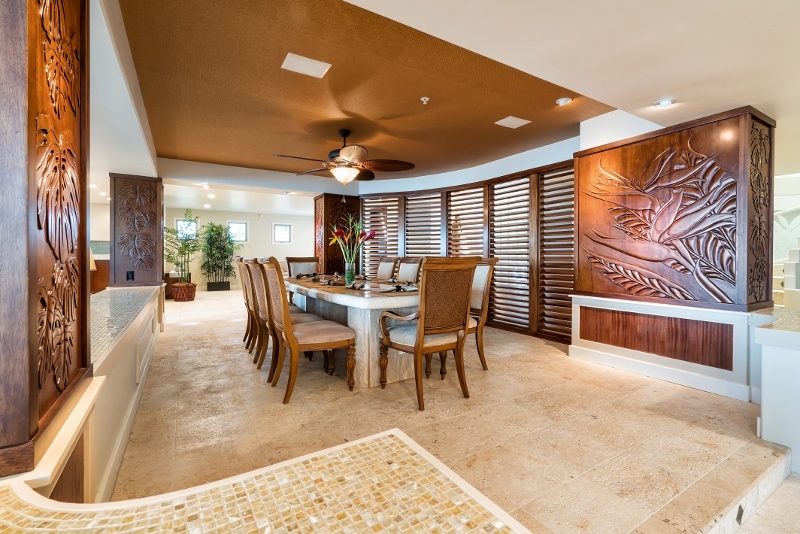 The guest wing becomes a completely separate 3 story home with its own private entrance, kitchen, dining room, and living room. 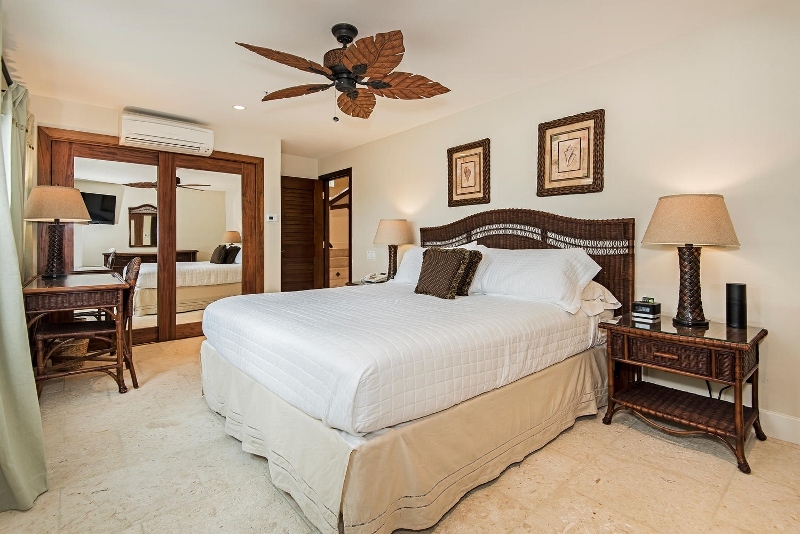 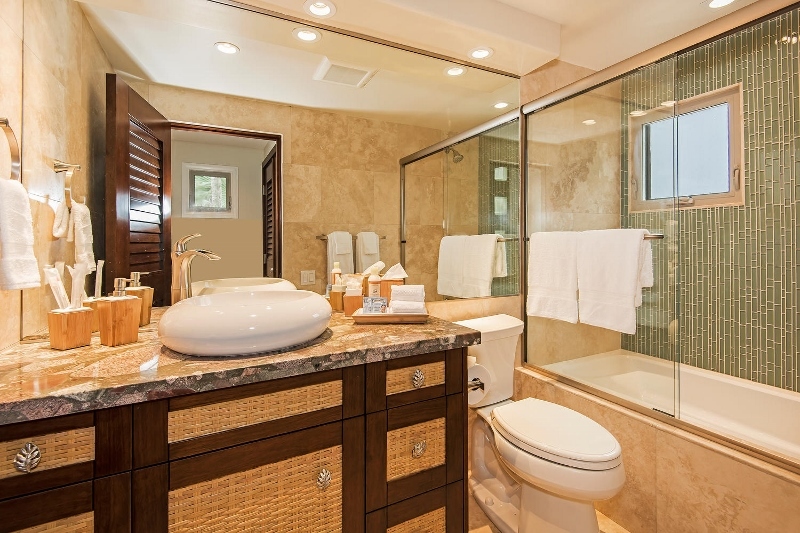 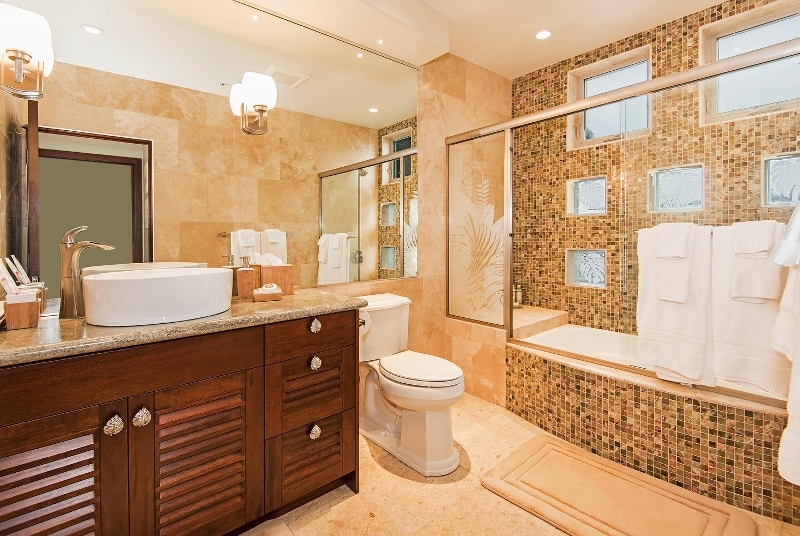 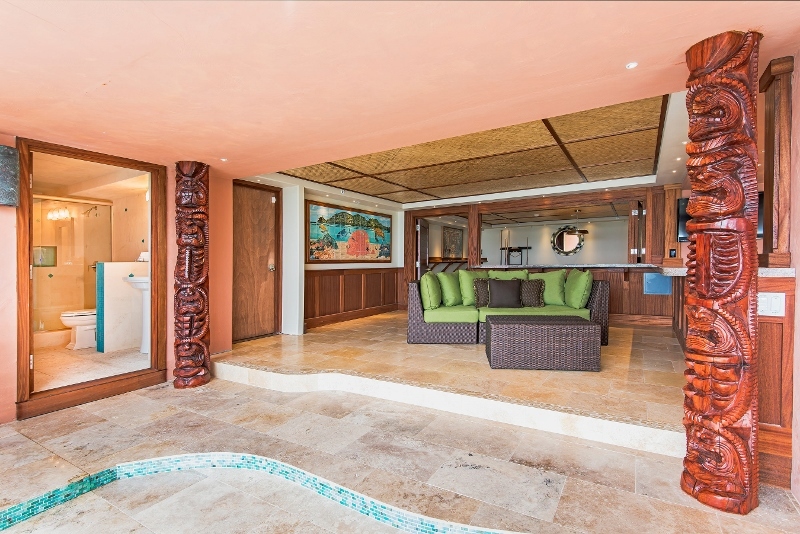 While staying at this luxurious beach estate, you will have no worries due to the attention to details going above and beyond expectations. 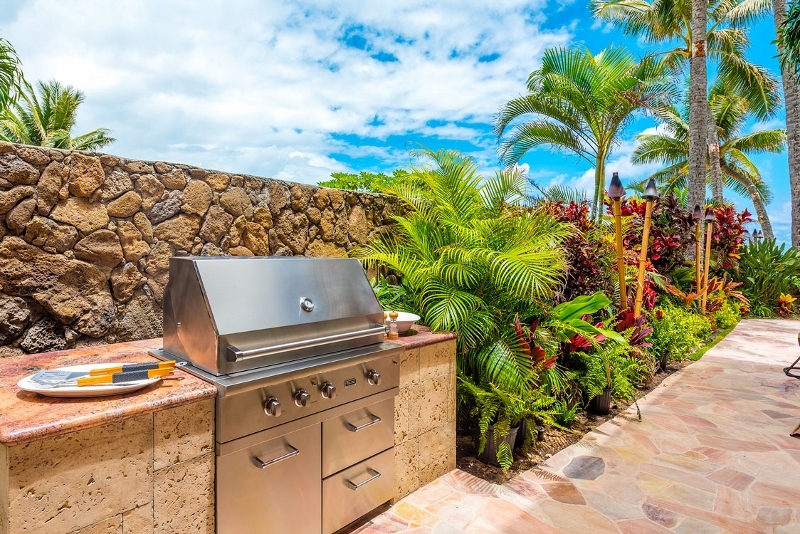 In addition to the comfortable bedrooms, large indoor living spaces, and gourmet kitchen, the outdoor spaces offer flexibility for entertaining or relaxing as you desire with your own private fenced yard and beach entrance, large covered patios, outdoor bars, BBQ grill, large pool with a built in slide and a lava rock waterfall, outdoor shower and hot tub! 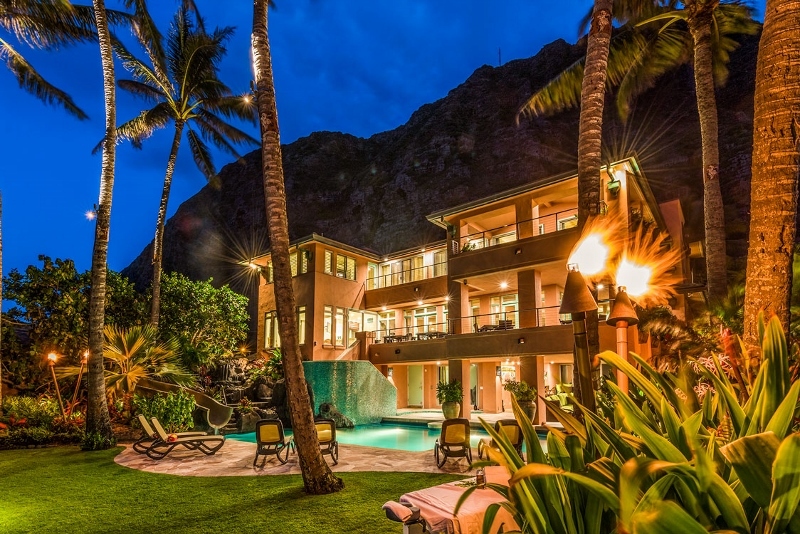 At night the estate is aglow with Tiki torches and custom landscape lighting. 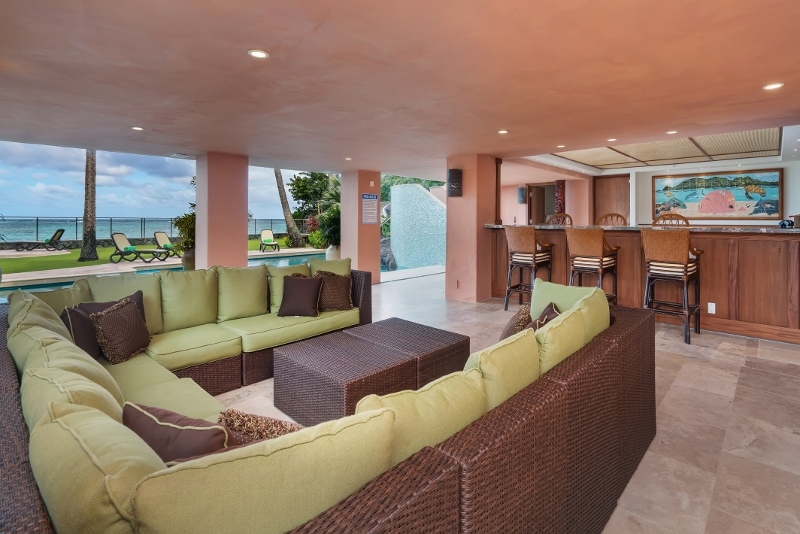 Enhance any gathering, indoor or out, with our whole house sound system including Pandora and Rhapsody. 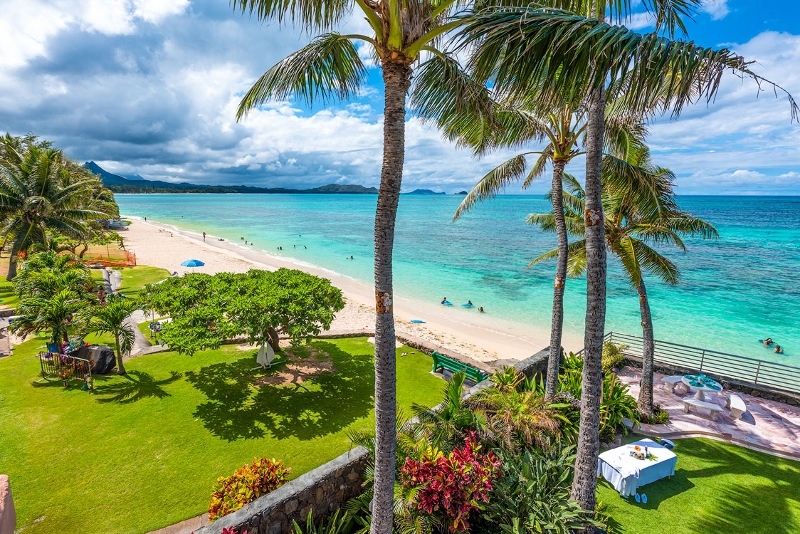 Almost any imaginable watersport and Hawaiian experience is in your proximity including Sea Life Park where you can swim with the dolphins and enjoy #1 rated Chief’s Hawaiian Luau fire dancers. 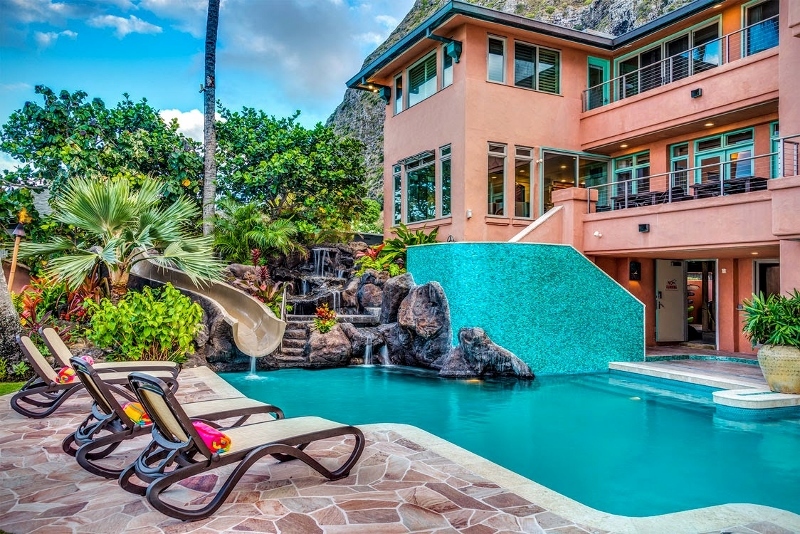 Travelling along the coastal Kalanianaole Highway, and just minutes away, you’ll find attractions such as Blowhole, Makapu’u Beach and Tide Pools, Sandy Beach, Makapu’u Lighthouse (for whale watching), multiple lookout points, Hanauma Bay for world famous snorkeling and Koko Marina, just to name a few. 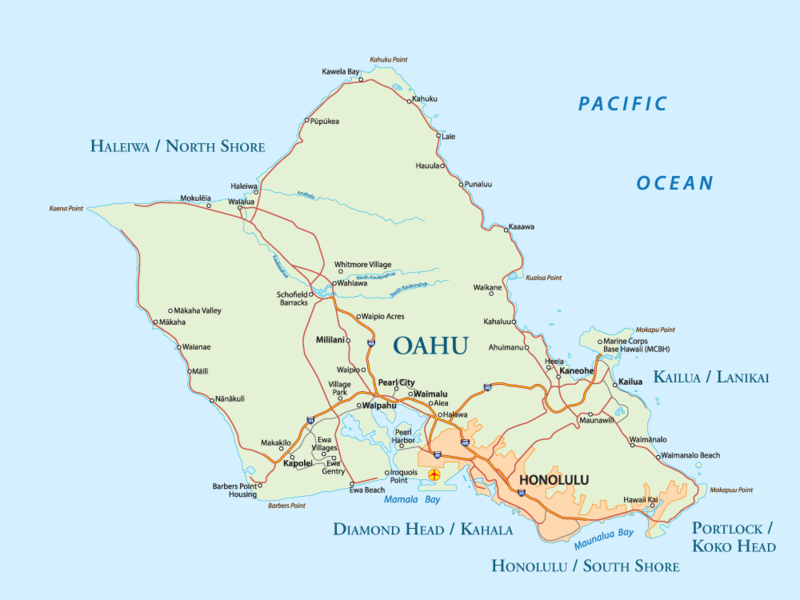 And don’t forget about the unbelievable trails, such as Koko Crater and Manoa Falls, which make for a great adventure. 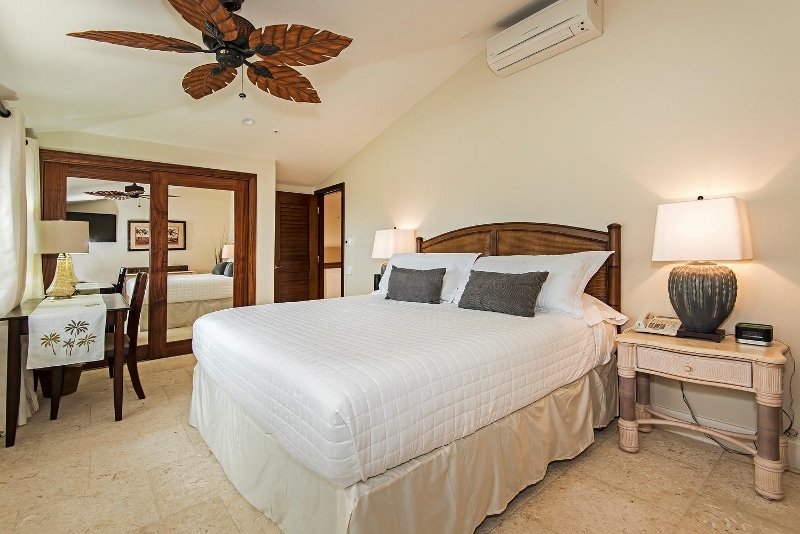 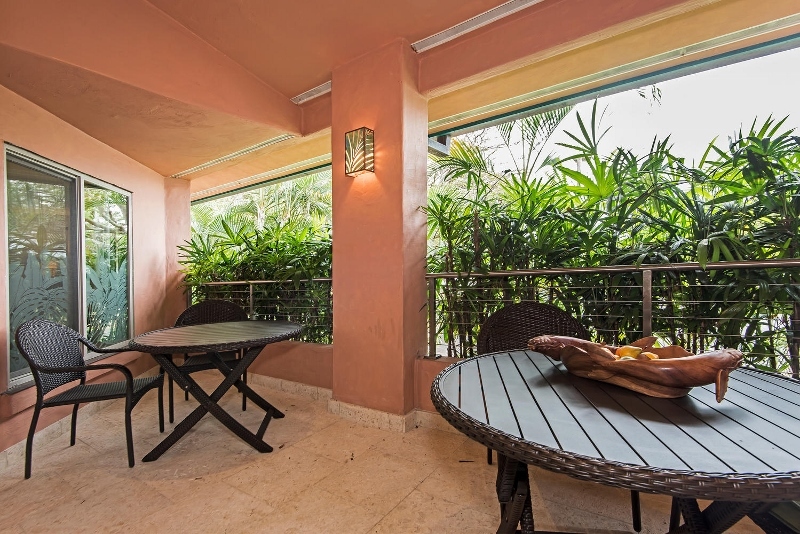 • Air conditioning and TV’s in all 9 bedrooms and the entire guest wing. 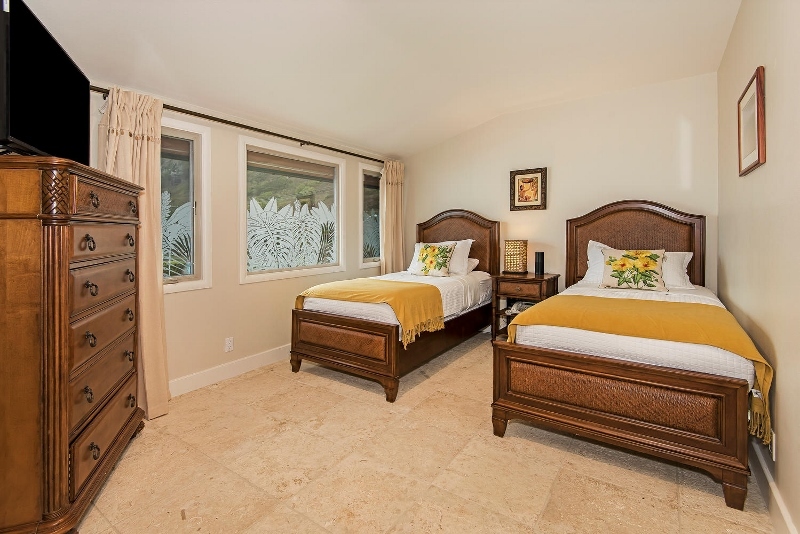 • Cribs, playpens, high chairs, etc. 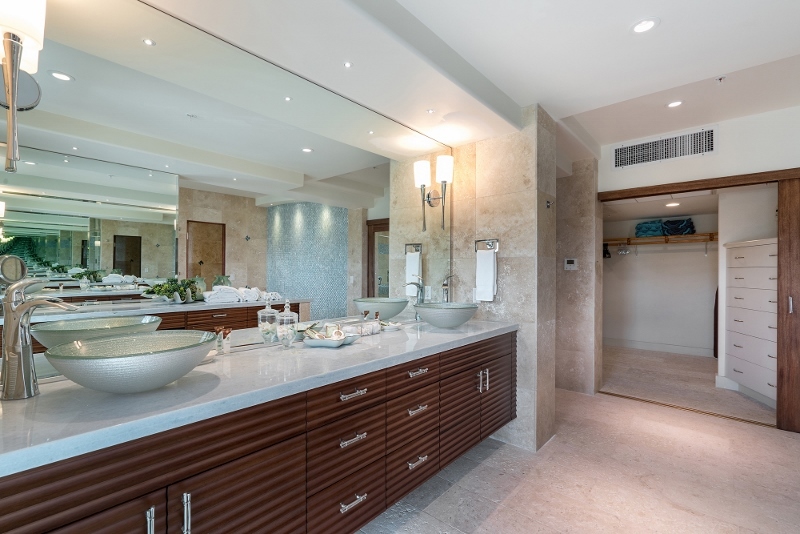 Just let us know what you need! 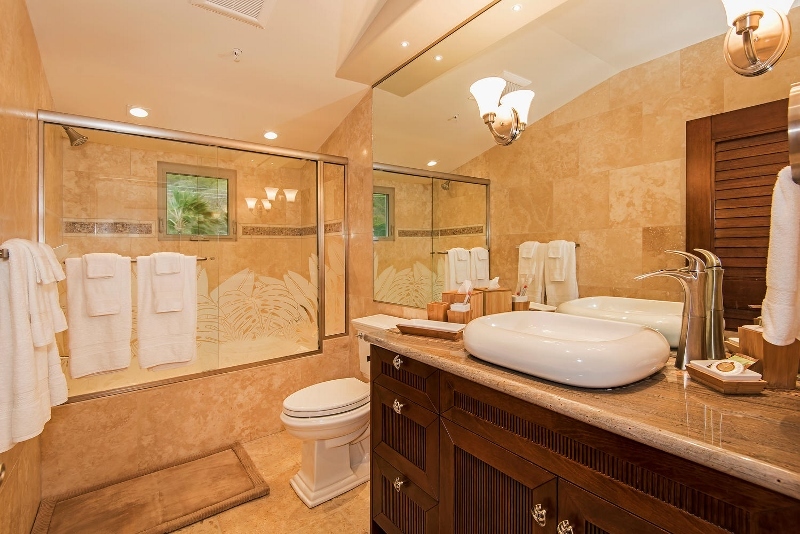 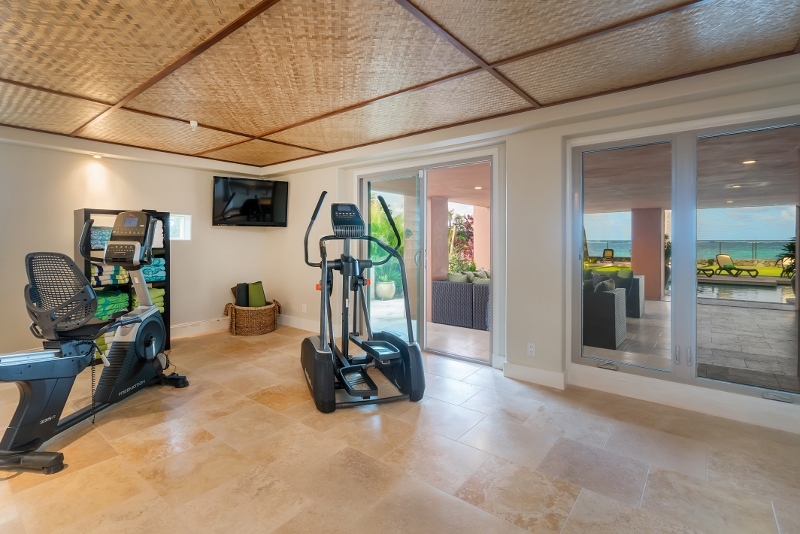 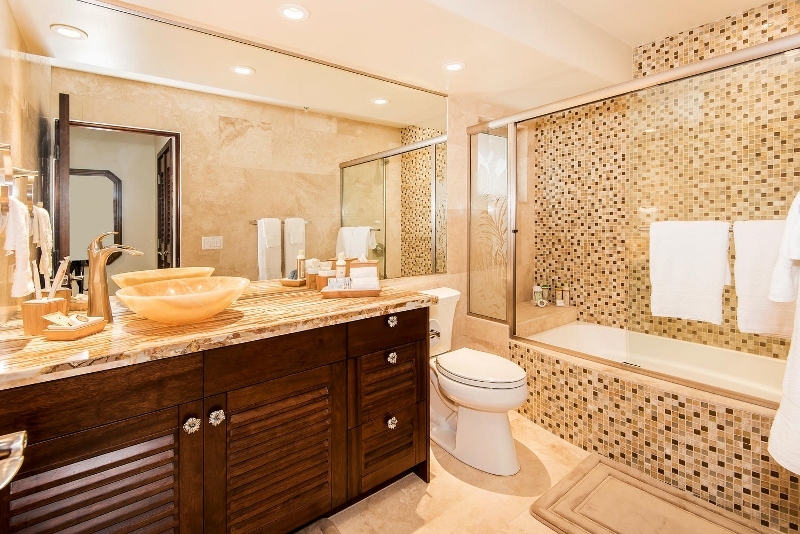 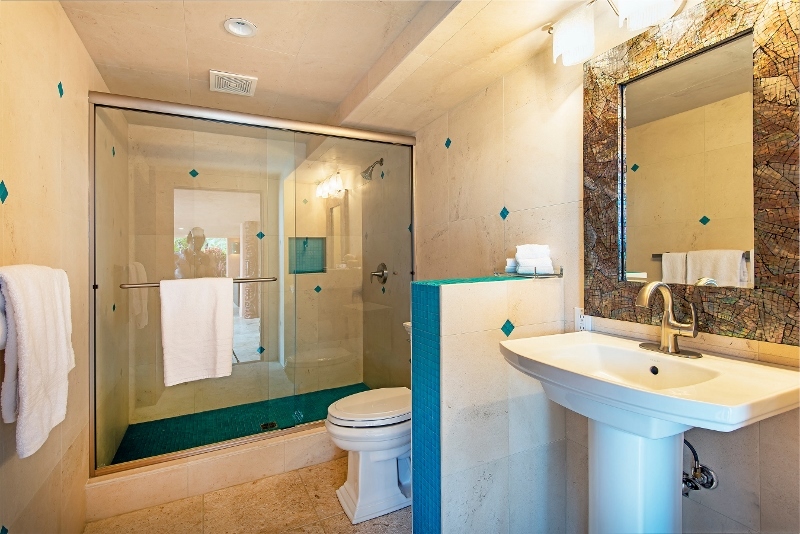 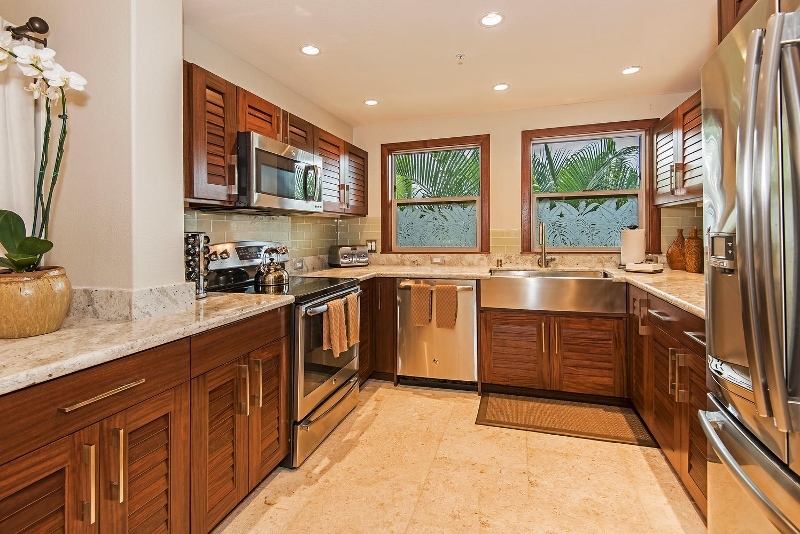 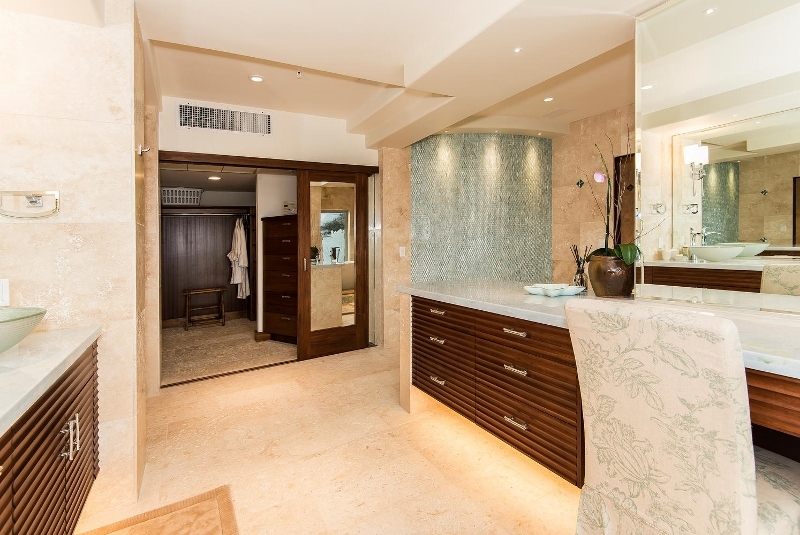 • TV’s in the kitchens, exercise room, and master bath. 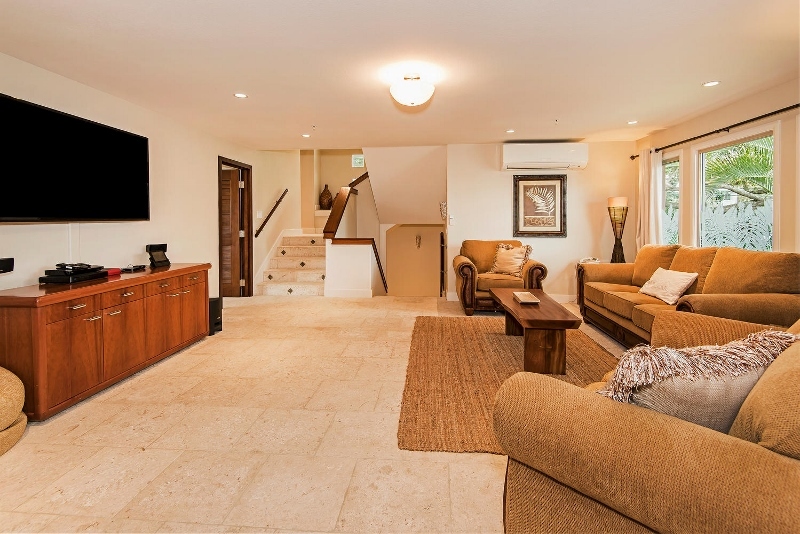 • Control4 Home Automation to control lights, lock doors (key-less entry) or arm security. 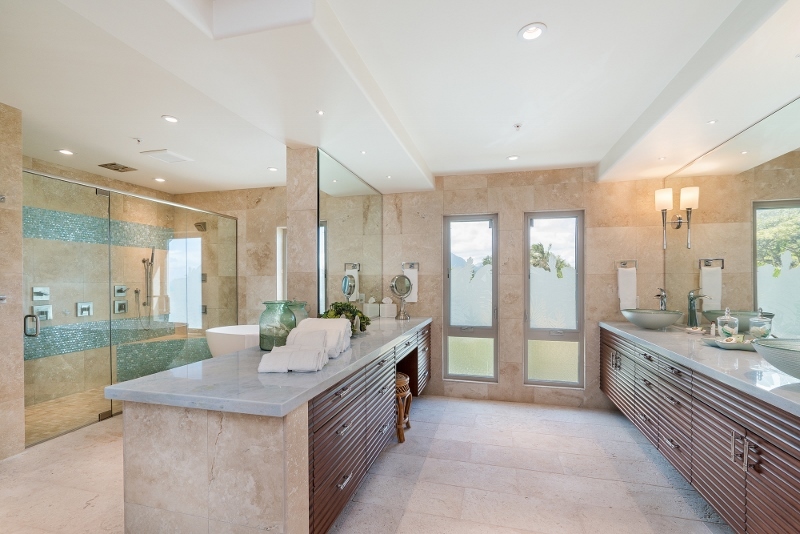 You can even control lights and sound with your own phone or iPad! 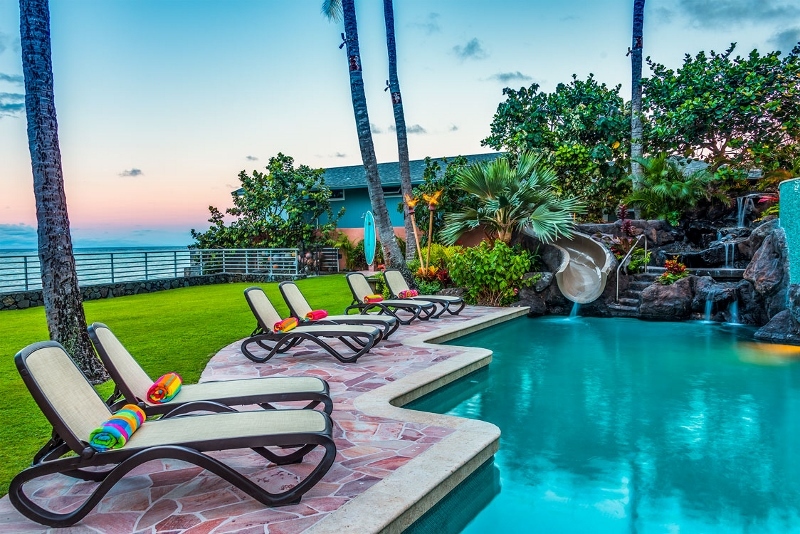 • Safety features including: removable fencing/gates for stairs/pool/balconies, safety turtle wrist bands that sound a high decibel alarm when children come into contact with water, children’s arm floats, state of the art security system that is simple to use including motion sensors, cameras, invisible beams, etc.